Step aside, Uber and Google, a career trucker is making history for self-driving tractor trailers. Jeff Runions, autonomous-truck test driver, prepares the future of the trucking industry. As he told NPR, Runions works for Starsky Robotics. They are a small company developing fully autonomous trucks for the highway. The trucks are driven by professionals once the trucks got off at the exit. As truck drivers continue to decrease in numbers, Runions hopes autonomous trucks will be a huge opportunity for the industry to keep up with demand. In his interview with NPR, he says automated vehicles would allow drivers to spend less time on the road and more time at home with their families. This would be a drastic change from the three weeks of on-road time he remembers from working on his own and with a commercial trucking company. In fact, Runions would like to see drivers having a “regular life” with a 40-hour work week. By making drivers’ lives more enjoyable, he hopes to spike interest in the industry from potential drivers. Volvo released a concept truck getting people talking. The incredible $40 million machine seems rather pricey for a semi-truck. The fancy new model sure is getting a lot of attention, even if it won’t hit the road anytime soon. The truck is still “cost-prohibitive,” truckinginfo.com wrote of the vehicle, but the knowledge gleaned from this grand experiment will apply to future Volvo programs. The goal of the Volvo SuperTruck project is to build vehicle prototypes that push the boundaries of both fuel and freight efficiency. And of course it’s hard to ignore the overall aerodynamic look of the truck. The smooth sweeping shape produced a 40% reduction in aero drag, not missing a corner. Since this is a concept truck and not a practical model, even the cab entry steps were covered up and the mirrors replaced with cameras. 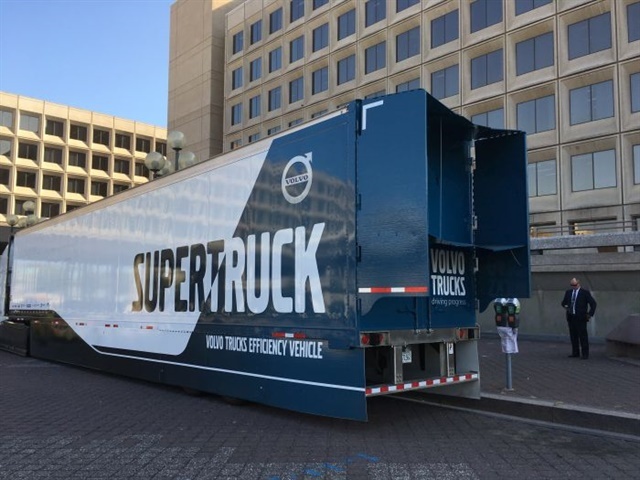 Some of the technologies on the SuperTruck aren’t likely to become used daily in CDL trucking jobs for a long time to come. But it sure is fun to dream. For CDL truck drivers, the joy is in the journey. Follow us on social media here and join the conversation. Any driver knows, it doesn’t take long to lose your concentration or even doze off at the wheel. So, those with CDL trucking jobs would be wise to have some sort of alert in place. The website Coolest-Gadgets.com highlighted a Anti-Sleep Alarm. It’s one that can be a valuable tool for those with CDL driver jobs. This Anti-Sleep Alarm is a two-finger ring that will let you know you’re starting to nod off before you actually do. If it works as intended, it will let you know up to 5 minutes before you start to slip into slumber. It charges via micro USB cable, and while it says it has a long battery life, that doesn’t mean it’s going to live through a 10-hour drive of constant use. The method of alarm it uses is vibration, and it should buzz for about 2-3 seconds when it goes off so that it’s sure you don’t “miss” feeling it. Costing $189, the alarm is made of an allergen-proof material and requires no special setup. It’s available for purchase on amazon.com. Stay alert on the job, and stay engaged with us! 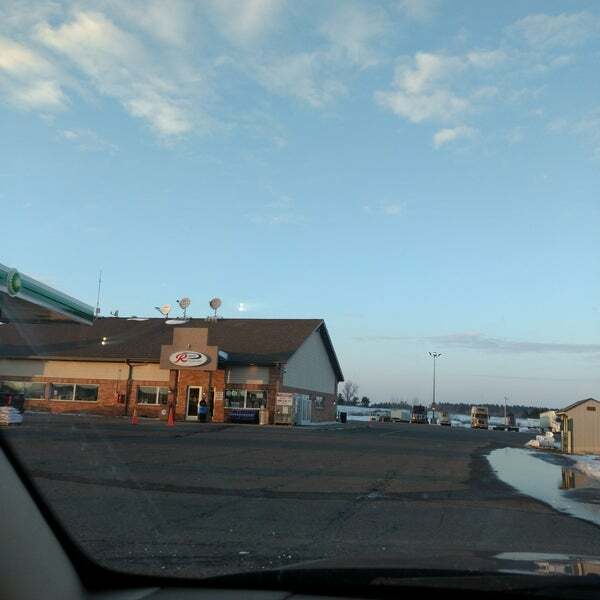 Click here to join the Drive My Way truck driving community on Facebook today. This slick, 17-tool gadget will help you MacGyver your way out of any jam. Stick it in your glove compartment and bust out the needlenose pliers or serrated knife when you need to put your fix-it skills to use, fast. You never know when you’ll need to jumpstart your car—or someone else’s. This pocket-sized battery comes with jumper cables as well as several outlets for charging your laptop, cell phone, camera, or tablet while you’re on the go. Tool #1 is just a flashlight, but tools #2 and #3 will save your life. If you’re in an accident and need to escape your car fast, they will safely cut your seatbelt and smash your window. Imagine just passing the last exit on the highway for 15 miles or being in the middle of nowhere when your low tire pressure light comes on. Total bummer—unless you stash this gadget in your trunk. Pull over, whip it out, and fill up your tire. No gas station (or quarters) required. Keeping a snow shovel in your trunk is a no-brainer for anyone in the northern half of the country, but if you choose the wrong one, your back will be barking at you for days. Suncast’s SC39050 shovel has a nice ergonomic design and a steel strip that prevents wear. We know you’re a model driver—a perfect citizen of the road who’d never exceed our state highways’ perfectly reasonable speed limits. But if you do get pulled over, you don’t want to be fumbling through your messy glove compartment to find your necessary paperwork. This keeps everything neatly in one place, so you won’t look like a schmuck. If you’re on a long trip, you’ll need to stay charged up—and so will your travel companions. This adapter lets you charge three phones or tablets at the same time. Never grab fast food on a long road trip again. Pack your own meals and store them at the perfect temperature with this genius thermo-electric system. Want more great gadget gear in your newsfeed? Join our community on Facebook here and don’t miss out! Truck parking is a little easier now with the launch of a new mobile app called Park My Truck. The new app connects people with CDL trucking jobs to free parking spots across the United States. With the app, public and private truck parking providers, including truck stops, rest areas and more, update the number of available parking spaces at any time to help drivers determine if open spaces exist at a given location. The app resulted from an initiative between the National Association of Truck Stop Operators (NATSO), the NATSO Foundation, the American Trucking Associations and the American Transportation Research Institute. 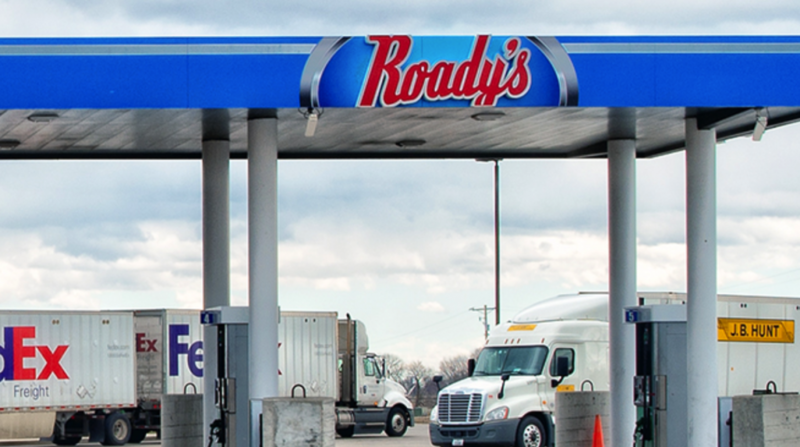 The app includes the total number of parking spaces at more than 5,000 truck stops. NATSO says independent and chain truck stops participate in reporting their available spaces. These represent more than 150,000 truck parking spaces. When a driver opens the app, he/she searches for parking spaces. The search remains within a certain distance of their current location, up to 250 miles, Overdrive writes. Drivers also search by state or along an interstate. Sometimes the solution is right at your fingertips. Follow Drive My Way on Facebook here as we strive to create solutions in the industry, too. As I step aside as president and chief executive of the ATA, I look ahead to the issues that will define our industry going forward. Here are five of great significance. Trucking has a shortage of drivers and of technicians. While some may dispute this, every measure from ATA’s economics team and nearly every conversation I have with those in the industry highlight the fact that trucking companies have trouble attracting qualified drivers and technicians to keep America’s trucks moving. As our trucks grow more and more complex, with more and more advanced technology, it will become even harder to find professional, dedicated technicians to maintain these vehicles.The simple solution to both of these issues is to improve the image of our industry and improve the pay of those who work in it. Both of these things are happening, and will continue to happen, so long as there’s a shortage of labor. Whether it’s called driverless or automated or smart, the rapid development of automated vehicle technology has the power to transform our industry in many ways. We see the need for these systems in the market today. They improve safety and efficiency, and from here the technology only advances. However, unanswered questions remain as we head down this path. We need to ensure that these technologies don’t compete with one another. While the industry enjoys affordable diesel fuel prices, this situation loses sustainability overtime. As the economy grows, demand for oil (and the gasoline and diesel fuel it produces) puts pressure on prices. CDL Life magazine wrote a fun article about the kind of tech professional truck drivers dream of. With technological creations advancing more each day, there’s no telling what cool gadgets truck drivers will have access to next. Until then, CDL Life asked truck drivers to imagine new technologies and equipment that would make their CDL trucking jobs easier. Here’s what truck drivers told the magazine in response. 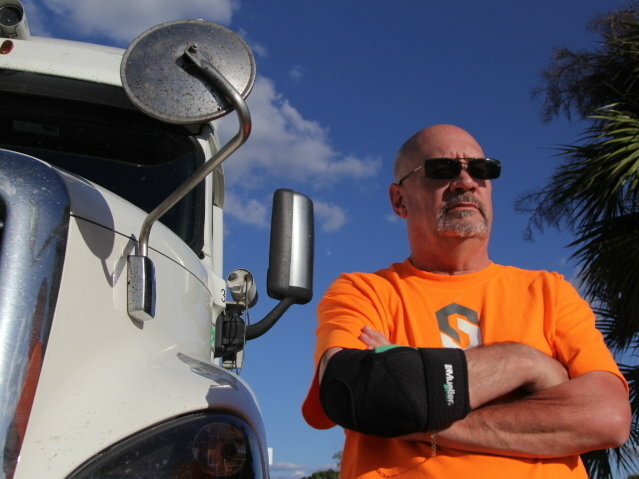 RoadPro Pro Driver Council member Tom Kyrk said he would like to see a ramp to help dogs get in and out of truck cabs easily and a fitness tracker designed especially for drivers (regular ones are thrown off by the vibration of the truck). Fred Weatherspoon doesn’t like to carry weights in his cab because they can become missiles in the event of a crash. He wants an in-cab exercise system that’s safe, easy to use and doesn’t take up too much space. All the cords hanging under her dash have Maggie Stone wishing for some sort of universal harness into which she could plug her phone, GPS, dash cam and other electronics. The Iowa livestock hauler also would like to see a storage device for under her bunk, “kind of like a gun rack,” that would hold her cattle prod and paddle and 5th wheel puller. Florida-based Allen Wilcher and partner Sierra Sugar said they would like to see a truck leveling system like the kind found in RVs — and room in the cab for an herb garden. There’s no way to know if any of these devices will be invented, but given the history of the trucking industry, it would be surprising if none of them were. Like this story? Like Drive My Way on Facebook here and get more of our content in your feed. The service is free to both parties, as the system is advertiser supported. 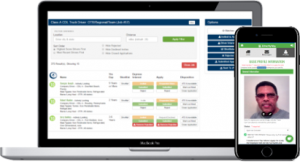 Traditional loadboards feature shippers and brokers posting loads and truckers searching for them. However, HaulHound effectively flips the script. Owner-operators and carriers post details about their truck, their capacity, and desired lanes. Then, shippers and brokers search for capacity. HaulHound says the system focuses on owner-operators who work the spot market. In addition to listing their equipment type and specializations, owner-operators list price points. So, any calls they receive from brokers or shippers are legitimately priced, says HaulHound’s Andy Kim. The company says it plans to release routing tools and automated freight-matching in coming iterations. Read more about this product on Overdrive.com here. Want more on newsworthy gadgets? Like our page here and get more content in your newsfeed. A new Accident Reporting App guides those with CDL trucking jobs through the accident reporting process and keeps administrators informed in real time. Truckinginfo.com wrote about the app, touting its usefulness in the trucking industry. The app leads the driver step by step through the process and documents every vital aspect of the event. It assembles it into a comprehensive accident report. 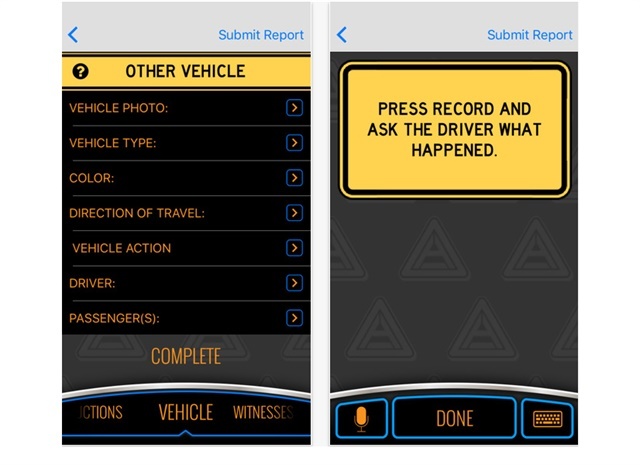 Also, the app features an animated, seven-chapter training video that teaches drivers in advance about proper accident protocol and crash scene conduct. It helps drivers focus on the task at hand and for motor carriers who need to proactively manage their claims. An annual subscription to Accident Plan costs $25 per driver. The app is available on the Apple App Store and Google Play store. Read more about the Accident Reporting App here. Like this story? Like us on Facebook here to get more Drive My Way news in your feed.